This story contains a bunch of jargon-y terms relating to the Alaska Permanent Fund. Check out the bottom of this post for a short glossary. 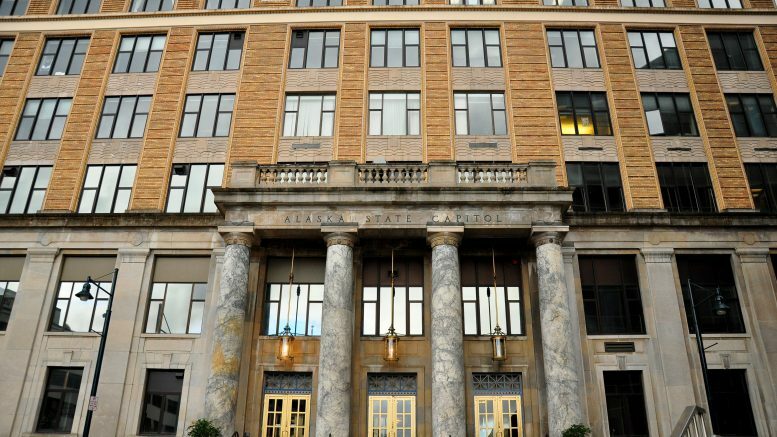 The Alaska Legislature this year will tap the earnings reserve account of the Alaska Permanent Fund to pay for government operations for the first time in the fund’s history, and today it approved rules that legislators hope will last well into the future. Both the House and Senate voted today to approve Senate Bill 26, legislation that its backers say amounts to a spending limit for future legislators. In effect, the legislation restructures the Alaska Permanent Fund, setting a maximum annual withdrawal limit in state law, while sidestepping the politically thorny issue of the permanent fund dividend. The legislation is a key piece of the state’s fiscal plan and a key part of the endgames of this session. It sets into law the Legislature’s intention to pay for part of government out of the earnings reserve account of the Alaska Permanent Fund both this year and into the future. The most significant impact of this (other than reducing dividends) is to allow the Alaska Permanent Fund Corporation to shift investment strategies to meet the new demand. The legislation seeks to set the total annual withdrawal–which will pay for both government and dividends–from the Alaska Permanent Fund at 5.25 percent of the fund’s average total market value over the last five years. That figure ratchets down to 5 percent after three years. That equals a roughly $2.7 billion draw this year with about $1 billion going to pay a $1,600 dividend to Alaskans this year, leaving about $1.7 billion for this year’s budget. Backers say the draw is expected to stay below the return the permanent fund sees from its investments, which have averaged above 8 percent over the last five years. Such a plan, backers say, will help prevent another Legislature from being tempted to draw beyond a sustainable draw thereby protecting the fund and dividends. “There isn’t another choice before us at this point in time to balance the budget,” said Sen. Anna MacKinnon, R-Anchorage. The legislation intentionally leaves the formula for PFDs untouched (the governor and Legislature have ignored the formula for the last two years and plan to do the same this year). It’s that flexibility that causes worry for many other legislators. Sen. Bill Wielechowski, an Anchorage Democrat who brought an legal challenge to Gov. Bill Walker’s 2016 veto of half the dividend to the Alaska Supreme Court (he was unsuccessful), said the Legislature should support putting the dividend into the constitution. He noted that, as was proved in his case, the dividend is subject to appropriation the Legislature and nothing one Legislature does can bind another. Rep. Scott Kawasaki, a Fairbanks Democrat who was one of six House majority coalition Democrats to vote against the bill, said he was worried that future Legislatures may choose to take the whole draw for state government. The use of the earnings reserve is a reality that most legislators agree is unavoidable given the state’s weak oil revenue and depleted savings accounts. Many other Democrats said they were generally supportive of the permanent fund being part of the mix but opposed Senate Bill 26, arguing that the state’s financial situation requires balance with a progressive income tax that captures revenue from out-of-state workers and the wealthy. Sen. Bert Stedman, R-Sitka, said he supported the bill because he believes there are “a bunch of financial vultures circling the permanent fund” and the rules will give the state time to have discussions about the rest of the budget. Alaska Permanent Fund: The entirety of the Alaska Permanent Fund that’s invested in various interests and has earned a return of 8.35 percent over the last five years.The total value of the Alaska Permanent Fund, according to a March 31, 2018 financial report, is $65.43 billion. Corpus of the permanent fund: The Alaska Constitution protects a vast majority of the permanent fund from being spent by the Legislature in any manner. The value of this portion is $46.96 billion. Earnings Reserve Account: The earnings from the Alaska Permanent Fund’s investments are held in this account (they only get transferred over to the corpus by the Legislature). They can be spent by a majority of the Legislature and, so far, have only been used to pay for dividends and inflation-proof the corpus of the permanent fund. This is the portion of the permanent fund that’s targeted by Senate Bill 26. The value of this portion is $17.6 billion. Constitutional Budget Reserve: This is the traditional savings account for the state. It is protected by the Alaska Constitution, requiring a three-quarter vote of each chamber to make a withdrawal. It’s been the main source of money for the Legislature to cover deficits that began in 2013 (when it was about $12 billion). Its current balance is $2.32 billion. Be the first to comment on "Legislature passes bill to protect permanent fund from the Legislature"